Mail on Sunday finally apologises to Ken Livingstone! Ken Livingstone said: “A massive thank you to the 1000s of people who gave their support over the last few days & to those who complained to the Mail on Sunday regarding their complete distortion of my recent remarks. The correction is welcome, but does not change the fact that 1000s of people saw – & other media outlets reprinted – these lies. Glen Owen, political editor of the Mail on Sunday (March 31) has watched the video of our excellent meeting ‘Defend the Left’ – and still manages to utterly and dishonestly misquote Ken Livingstone. Even in the headline, he charges Ken with having said: “It is not anti-Semitic to hate the Jews of Israel.” But clearly, Ken only listed this as one of the ridiculous charges made against him! 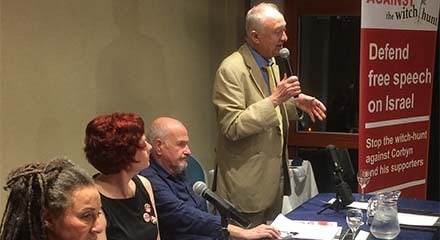 Proof of Ken Livingstone’s speech can be found in our video here, from 14.20mins.